I trudged home on Saturday afternoon feeling as every Addick did; depressed, frustrated, annoyed and angry. Another home defeat. Another loss to our rivals. I wasn’t happy and no one was spared my wrath. “What the f*ck is going on? !”, me and my friends were yelling at each other, “that player’s useless”, “he’s sh*t” and “why can’t Powell win at home?” were all phrases muttered numerous times on the damp walk home. It’s the natural response of a football fan to point the finger, to react angrily and unreasonably after a poor result. It’s an inconsolable feeling losing to your rivals and we are all guilty of wanting to punish whoever we feel is responsible for causing us such grief. The incompetent ref, the opposition’s dirty tactics, the misfiring striker and yes, in some cases, the manager. Admittedly in the immediate aftermath to the Millwall defeat I was cursing everyone and anyone on the pitch that day – Chris Powell included. Yet after a cup of tea and a bit of a lie down I realised that really, things weren’t so bad. After all, a year ago we were playing Wycombe at home. A year before that we were losing to Dagenham & Redbridge at home. Yes, I was still angry about the losses at home, but I was no longer chomping at the bit to see the players dropped or our manager sacked. 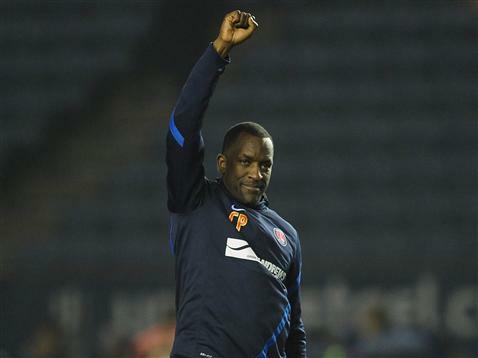 Logging onto Twitter it became apparent that not everyone agreed with me (and as football fans we will always have differing opinions), yet as the red mist subsided I realised that personally, there was no one else I would rather have in charge of my club than Chris Powell. As manager of Charlton Chris Powell has already gifted us one of our greatest ever seasons; don’t we owe him a few frustrating ones? It has been masked by the horror of the home form, but Powell is still doing a good job at Charlton. We are a promoted club on a miniscule budget in comparison to the clubs around us (our squad is of the third lowest market value in the league – only Barnsley and Peterborough sit below us), and as such nothing more than survival could have ever have been considered a realistic aim. Some people will always be convinced that we should have followed in the footsteps of Norwich and Southampton but the truth is both clubs were financially backed in a way we haven’t been. As a surprisingly wise Martin Allen said on BBC’s “Late Kick Off” on Sunday night; in losing to Millwall Powell “lost a battle, but his war was to keep Charlton up.” As it currently stands, that’s a war he’s winning. Powell’s last “war” was to take us out of League One and into the Championship. He achieved it in a blaze of glory. After two years of depressing dormancy Powell oversaw the best season us Addicks have enjoyed for years. The final game of the season against Hartlepool will go down as one of the most memorable days our beloved ground has ever seen. A packed stadium, delirious fans and a team to be proud of. The atmosphere that day was charged with a positive force that had not been seen since the Curbishley era. This was Powell’s greatest achievement, not the on pitch success, but the re-ignition of positivity and excitement at Charlton. Every single Addick walked away from The Valley last May as proud to be a Charlton fan as they have ever been. As manager of Charlton Chris Powell has already gifted us one of our greatest ever seasons; don’t we owe him a few frustrating ones? After Nigel Adkins and then Brian McDermott were sacked by promoted clubs to the Premier League many argued that they were victims of their own achievements in the Championship. I hope we never have to say the same about Powell’s achievements in League One. Those achievements demonstrated that Powell is a competent manager. Yet the reasons I have for claiming he is the right man for Charlton go beyond any argument of results or tactical competence. Powell is the right man for Charlton becuase he is Charlton. He encapsulates everything that is great about our club. Perhaps it’s a strange thing to be proud of, but I am genuinely proud of the fact that we have a manager universally liked and respected by all those in the game. When in charge the manager is the face of the club, he represents it to all those outside. 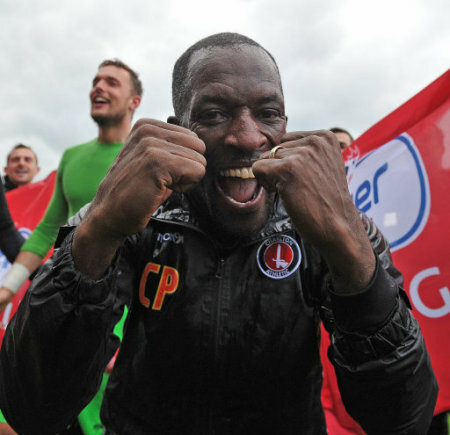 Chris Powell is the perfect representative for Charlton Athletic. Have you ever heard Powell launch into a derogatory attack on a referee? Or slander an opposition player? No. While the majority of managers seem happy to leave their dignity at the home as they moan and groan to the cameras, Powell remains composed and respectful. He is simply a good man. A rare role model in the murk of modern football. Under Powell we have seen the development of a side full of young, hungry players who conduct themselves in the right way. We don’t have the most talented side in the league but Powell has made sure that every player coming to Charlton will respect the badge and represent it with honesty and hard work. Under Powell effort and playing for the shirt will never be one of our limitations. He knows intimately the values of community and honesty that define Charlton and he can transmit that to his players. Unlike previous managers Powell’s role at Charlton is more than just a job, it is a chance to progress a club he loves and cares for. For years we put up with mercenary players who simply went through the motions. Faceless footballers just at Charlton to pick up the paycheck. Not under Powell. But perhaps most importantly, I see Powell as one of the few men left in the upper echelons of the club who are true representatives of Charlton Athletic. Fan representatives have been removed from the board at an alarming rate. Peter Varney, who brought Powell into the club, has now left his role as vice-chairman. Chairman Michael Slater has been limited in his contact with the fans while joint-owner Tony Jiminez hasn’t uttered a word. Do these men represent the best interests of Charlton? It’s hard to tell. Does Chris Powell? You can bet on it. We currently have a manager who loves the club nearly as much as we do. A manager who is the perfect representative of our values. A manager who was legend as a player and played a huge role in the most successful years of our history. A manager who has fulfilled every remit required from his role so far. Fans of countless other clubs would give anything to be able to say the same. Let’s not sacrifice all of that because of one frustrating season. He’s turned it around before, he can turn it around again. In Chris Powell I trust. This entry was posted in Blogs and tagged Charlton Athletic, Chris Powell. Bookmark the permalink. Great article, well said. And, you have beaten the likely champions this season, after being two nil down, so it’s not all bad! Very well said, and at the right time, some expect to much to soon, in Powell I trust, he is one of us. Couldn’t agree more – nice blog..